Relax in the Day Parlour used by the Ferrers family to gather in before dining then step into the Tudor Dining Room with large, colourful tapestries decorating the walls. Sit at the table in front of the large, log fireplace to really get a feel of this marvellous room. The Tamworth Story houses our display of the Staffordshire Hoard, which you can see the Saxon weapons and a range of real and replica items found as part of the Staffordshire Hoard. Venture up our tower which gives 360° views of Tamworth, including St. Editha’s Church and the surrounding Castle Grounds. Our Lady’s Chamber, one of the grand wooden panelled rooms, houses a special four-poster bed graciously supplied by the V&A Museum. 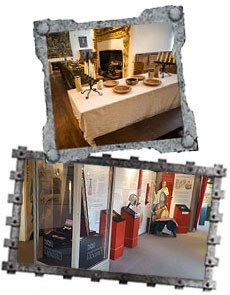 The South Range of the Castle shows the life of the families who lived in the Castle in its more recent years, before it was opened as a museum in 1897. 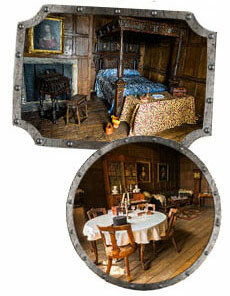 The Townshends and the Cookes had very refined tastes and this is clearly shown in the Bedroom and With-Drawing Room.